If you have an older home, chances are part of your plumbing is made from cast iron. And if you’re tackling a plumbing project, then you’re probably wondering how to cut cast iron pipe. Cast iron pipe holds the unique distinction of being very brittle as well as very strong — making it difficult to modify it. While it is seldom installed these days, cast iron pipe is often removed and replaced as it fails in older homes. For this reason, knowing how to cut cast iron pipe is essential if you intend to work on your home’s plumbing. #1 – Use a hacksaw. 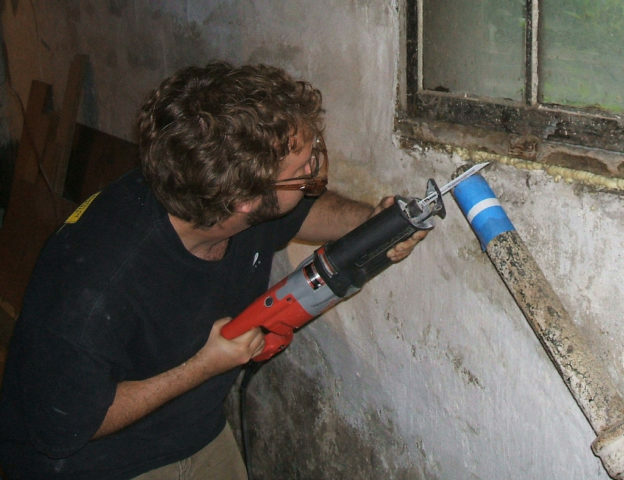 You can definitely use a hacksaw to cut through a piece of cast iron pipe. However, this is the slowest and most difficult method available. Using a hacksaw to cut through a cast iron pipe will require multiple replacement blades . For that reason, this method should only be used as a last resort. #2 – Use a cold chisel. Using a cold chisel to cut through a cast iron pipe is much more efficient than using a hacksaw. But it requires considerably more skill. A ball peen hammer and cold chisel are among the most difficult hand tools to use accurately and effectively — making this a frustrating endeavor for the amateur. In addition to this hindrance, the cold chisel method for cutting cast iron pipe only works when you have access to all sides of the pipe and you have enough room to maneuver your chisel. Draw a line using some chalk around the pipe where you wish to cut it. Using the cold chisel, start making small marks around the diameter of pipe along the chalk line. Because cast iron is brittle, the pipe should split after a few rotations over the same line. Although many cast iron pipes will break cleanly using the cold chisel method, a jagged cut is also not unusual. This may not be an issue — depending on your reason for cutting the pipe. But if you wish to create a smoother cut you should be able to remove any jagged pieces with an adjustable wrench and hammer. #3 – Use a snap cutter. If you have more than a single cut to make, renting a snap cutter is well worth the cost — if you can’t justify purchasing one for a small job. This is the only method that plumbers use when working with cast iron pipe. Despite its name, a snap cutter does not really “cut” so much as “break” the pipe at the designated location. A snap cutter consists of a piece of roller chain and a ratchet. Place the chain around the pipe where it exerts even pressure around the pipe. As the pressure increases, the wheels embedded in the chain will bite into the cast iron until it snaps. A snap cutter almost always creates a smooth cut and is by far the quickest method to cut cast iron pipe.